Happy Monday friends! 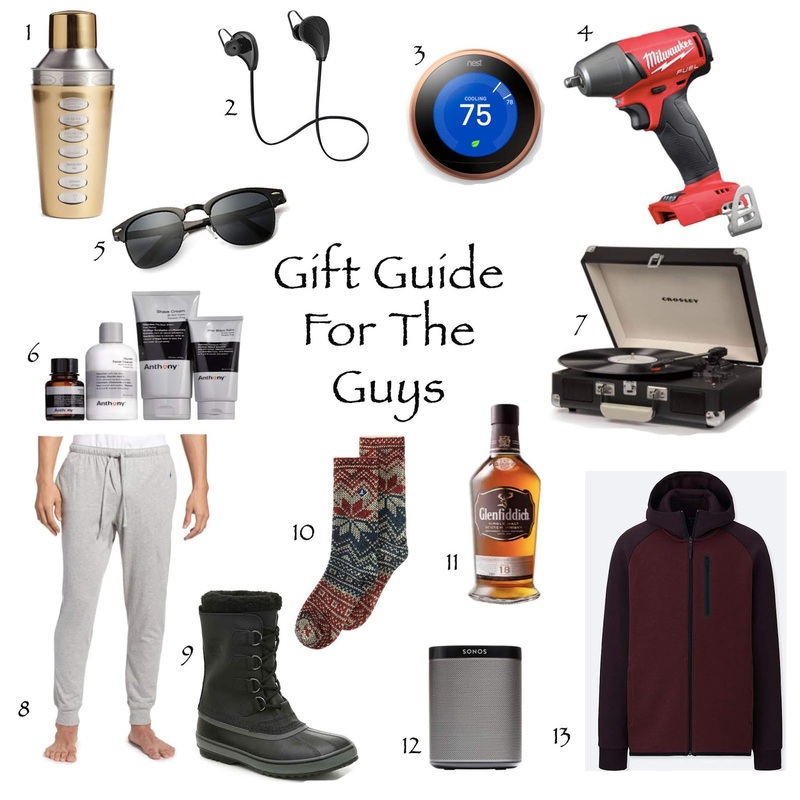 I'm on a roll with gift guides, today's is for all the guys in our lives. The guys in my life can be hard to shop for so I like to get their gifts out of the way early instead of scrambling at the last minute. Since I'm not a guy and really have no idea what guys really want I asked K and my brother to help me out with these ideas. I hope you enjoy, happy gift shopping! My dad, K and my father-in-law all love to mix cocktails. This cocktail shaker is perfect for guys like them how might not have cocktail recipes memorized because it has several recipes engraved on it's outer sleeve. All guys need and want these is some shape or form. K likes the smaller type earbuds and my brother has a pair like these. I've read so many great things about this thermostat and how it helps regulate temps at home and ultimately save money. The guys in my life all love to save money. The guys in my family are booth handy and frugal. They prefer to do small jobs around the house themselves and a cordless drill can be a huge help. This one gets great reviews. Just wait a month or two before you start giving your guys a 'honey-do list'... lol. K has had these for a couple years and uses them regularly. You can't beat the price! This was my brother's suggestion. He says that guys won't buy nice grooming stuff for themselves but will happily use them. This was my gift idea. I think listening to music with your loved one is so fun and why not try out a turntable and listen to some new records. It's kind of old school and romantic. Never enough joggers or sweatpants! The snow has already started falling and it's important to keep our guys feet dry and warm. Sorel is one of my favorite snow boot brands. Oh... and never enough cozy socks either. A nice scotch is always a classy gift. In the past I gained some extra points with my in-laws by impressing my father-in-law with an aged scotch he hadn't had the chance to try before. Wireless speakers are great for so many occasions. Tailgating, BBQ's, boating, camping and so many more guy type activities. I'll probably be getting K and his brother one of these this year. They both like sporty gear and hoodies. I like the look of this hoodie, it's a bit chic and I think the wine color stands out from the norm.